今天，我们怀着喜悦的心情，在这里隆重集会，庆祝香港回归祖国20周年，举行香港特别行政区第五届政府就职典礼。 Today, we are meeting on this solemn and joyous occasion to both celebrate the 20th anniversary of Hong Kong's return to the motherland and hold the inaugural ceremony of the fifth-term government of the Hong Kong Special Administrative Region. 首先，我代表中央政府和全国各族人民，向全体香港居民，致以诚挚的问候！向新就任的香港特别行政区第五任行政长官林郑月娥女士，向香港特别行政区第五届政府主要官员、行政会议成员，表示热烈的祝贺！向所有关心支持香港的海内外同胞和国际友人，表示衷心的感谢！ First of all, on behalf of the Central Government and the people of all ethnic groups across the country, I wish to extend our cordial greetings to all the people in Hong Kong and our warm congratulations to Madam Carrie Lam Cheng Yuet-ngor, the newly inaugurated fifth-term Chief Executive of the HKSAR, principal officials of the fifth-term HKSAR government and members of the Executive Council. I also express our heartfelt thanks to all our fellow Chinese, both at home and abroad, and foreign friends for their good wishes and support to Hong Kong. 此时此刻，站在经过岁月洗礼、发生沧桑巨变的香江之滨，我们抚今追昔，感慨万千。 Meeting here on the shores of Hong Kong, which have stood the test of time and seen profound changes, we are filled with thoughts and emotions, as we reflect on the extraordinary journey we have taken to get where we are today. 香港的命运从来同祖国紧密相连。近代以后，由于封建统治腐败、国力衰弱，中华民族陷入深重苦难。19世纪40年代初，区区一万多英国远征军的入侵，竟然迫使有80万军队的清朝政府割地赔款、割让香港岛。鸦片战争之后，中国更是一次次被领土幅员和人口规模都远远不如自己的国家打败，九龙、“新界”也在那个时候被迫离开了祖国怀抱。那时的中国历史，写满了民族的屈辱和人民的悲痛。只有当中国共产党领导中国人民经过艰苦卓绝的奋斗赢得民族独立和解放、建立新中国之后，中国人民才真正站立起来，并探索开辟出一条中国特色社会主义光明道路。上世纪70年代末以来，我们进行改革开放，经过近40年努力，开创了中华民族发展崭新局面。 The destiny of Hong Kong has always been intricately bound with that of the motherland. After modern times, with a weak China under corrupt and incompetent feudal rule, the Chinese nation was plunged into deep suffering. In the early 1840s, Britain sent an expeditionary force of a mere 10,000 troops to invade China and got its way in forcing the Qing government, which had an 800,000-strong army, to pay reparations and cede the island of Hong Kong to it. After the Opium War, China was repeatedly defeated by countries which were far smaller in size and population. Kowloon and "New Territories" were forcibly taken away. That page of Chinese history was one of humiliation and sorrow. It was not until the Communist Party of China led the Chinese people to victory in a dauntless and tenacious struggle for national independence and liberation and founded New China that the Chinese people truly stood up and blazed a bright path of socialism with distinctive Chinese features. Thanks to close to four decades of dedicated efforts since the launch of the reform and opening-up policy in the late 1970s, we have entered a new era in the development of the Chinese nation. 在改革开放的历史条件和时代背景下，邓小平先生提出了“一国两制”伟大构想，并以此为指引，通过同英国的外交谈判，顺利解决了历史遗留的香港问题。20年前的今天，香港回到祖国的怀抱，洗刷了民族百年耻辱，完成了实现祖国完全统一的重要一步。香港回归祖国是彪炳中华民族史册的千秋功业，香港从此走上同祖国共同发展、永不分离的宽广道路。 It was against the historical backdrop of reform and opening-up that Mr. Deng Xiaoping put forward the great vision of "One Country, Two Systems", which guided China's diplomatic negotiations with the United Kingdom that led to the successful resolution of the Hong Kong question, an issue that was left over from the past. Twenty years ago today, Hong Kong returned to the embrace of the motherland. This ended past humiliation and marked a major step forward toward the complete reunification of China. Hong Kong's return to the motherland has gone down as a monumental achievement in the history of the Chinese nation. Hong Kong has since then embarked on a journey of unity and common development with the motherland. 斗转星移，岁月如梭。香港已经回归祖国20年。依照中国的传统，男子二十谓之弱冠，今天就是香港特别行政区的成年礼，正所谓“如竹苞矣，如松茂矣”。回首香港特别行政区的成长历程，我们可以自豪地说，20年来，香港依托祖国、面向世界、益以新创，不断塑造自己的现代化风貌，“一国两制”在香港的实践取得了举世公认的成功。 Time flies fast! It has been 20 years since Hong Kong's return to the motherland. According to China's tradition, a man enters adulthood at the age of 20. So today, we are celebrating the coming of age of the HKSAR, which has grown exuberant like a bamboo or a pine tree. Looking back at the HKSAR's growth, we can proudly conclude that thanks to the support of the motherland and with an international vision and an innovative spirit, Hong Kong has in the last two decades continued to develop itself as a modern metropolis. The practice of "One Country, Two Systems" in Hong Kong is a success story recognized by all. ——回到祖国怀抱的香港已经融入中华民族伟大复兴的壮阔征程。作为直辖于中央政府的一个特别行政区，香港从回归之日起，重新纳入国家治理体系。中央政府依照宪法和香港特别行政区基本法对香港实行管治，与之相应的特别行政区制度和体制得以确立。香港同祖国内地的联系越来越紧密，交流合作越来越深化。香港各界人士积极投身国家改革开放和现代化建设，作出独特而重要的贡献。香港同胞对国家发展和民族复兴的信心不断增强，同内地人民共享伟大祖国的尊严和荣耀。 -- Since its return to the motherland, Hong Kong has joined the remarkable journey toward the great renewal of the Chinese nation. As a special administrative region directly under the Central Government, Hong Kong has been re-integrated into China's national governance system since the very day of its return. The Central Government exercises jurisdiction over Hong Hong in accordance with China's Constitution and the Basic Law of the HKSAR, and corresponding systems and institutions have been set up for the special administrative region. Hong Kong's ties with the mainland have grown increasingly close, so have its interactions and cooperation with the mainland. The people of Hong Kong have played an active part in China's reform, opening-up and modernization drive and made their unique and important contribution to this endeavor. They have ever stronger confidence in China's development and national renewal, and share with the people on the mainland the dignity and honor of our great motherland. ——回到祖国怀抱的香港继续保持繁荣稳定。回归后，香港自身特色和优势得以保持，中西合璧的风采浪漫依然，活力之都的魅力更胜往昔。在“一国两制”之下，香港原有资本主义制度和生活方式保持不变，法律基本不变。香港同胞当家作主，自行管理特别行政区自治范围内事务，香港居民享有比历史上任何时候都更广泛的民主权利和自由。香港抵御了亚洲金融危机、非典疫情、国际金融危机的冲击，巩固了国际金融、航运、贸易中心地位，继续被众多国际机构评选为全球最自由经济体和最具竞争力的地区之一。香港各项事业取得长足进步，对外交往日益活跃，国际影响进一步扩大。 -- Since its return to the motherland, Hong Kong has maintained prosperity and stability. Hong Kong has kept its distinct features and strengths. Its allure of being a vibrant metropolis where the East meets the West has remained as strong as ever. Under the practice of "One Country, Two Systems", Hong Kong has retained its previous capitalist system and way of life, and its laws have remained basically unchanged. The people of Hong Kong, now masters of their own house, run their local affairs within the purview of autonomy of the HKSAR. The people of Hong Kong enjoy more extensive democratic rights and freedoms than at any other time in its history. Having withstood the impact of the Asian financial crisis, the SARS epidemic and the global financial crisis, Hong Kong has emerged stronger as an international financial, shipping and trading center; and it has been consistently rated by many international institutions as one of the freest economies and most competitive regions in the world. Hong Kong has made substantial advances in various programs, increased external interactions and raised its international profile. 实践充分证明，“一国两制”是历史遗留的香港问题的最佳解决方案，也是香港回归后保持长期繁荣稳定的最佳制度安排，是行得通、办得到、得人心的。 What has happened in Hong Kong fully demonstrates that the concept of "One Country, Two Systems" provides the best solution to the historical question of Hong Kong and the best institutional arrangement to ensure Hong Kong's long-term prosperity and stability after its return. "One Country, Two Systems" has proved to be a workable solution welcomed by the people. “一国两制”是中国的一个伟大创举，是中国为国际社会解决类似问题提供的一个新思路新方案，是中华民族为世界和平与发展作出的新贡献，凝结了海纳百川、有容乃大的中国智慧。坚持“一国两制”方针，深入推进“一国两制”实践，符合香港居民利益，符合香港繁荣稳定实际需要，符合国家根本利益，符合全国人民共同意愿。因此，我明确讲过，中央贯彻“一国两制”方针坚持两点，一是坚定不移，不会变、不动摇；二是全面准确，确保“一国两制”在香港的实践不走样、不变形，始终沿着正确方向前进。 "One Country, Two Systems" is a great initiative pursued by China. It offers a new way of thinking and a new formula to the international community in addressing similar issues. It is another contribution made by the Chinese nation to promoting global peace and development. And it embodies the Chinese vision which values openness and inclusiveness. To uphold and implement the principle of "One Country, Two Systems" meets the interests of the Hong Kong people, responds to the needs of maintaining Hong Kong's prosperity and stability, serves the fundamental interests of the nation, and meets the shared aspiration of all Chinese. That is why I have made it clear that the Central Government will unswervingly implement the policy of "One Country, Two Systems" and make sure that it is fully applied in Hong Kong without being bent or distorted. This will enable us to keep advancing in the right direction. 作为一项前无古人的开创性事业，“一国两制”需要在实践中不断探索。当前，“一国两制”在香港的实践遇到一些新情况新问题。香港维护国家主权、安全、发展利益的制度还需完善，对国家历史、民族文化的教育宣传有待加强，社会在一些重大政治法律问题上还缺乏共识，经济发展也面临不少挑战，传统优势相对减弱，新的经济增长点尚未形成，住房等民生问题比较突出。解决这些问题，满足香港居民对美好生活的期待，继续推动香港各项事业向前发展，归根到底是要坚守方向、踩实步伐，全面准确理解和贯彻“一国两制”方针。借此机会，我对今后更好在香港落实“一国两制”谈几点意见。 "One Country, Two Systems" is a pioneering initiative that has no precedent to follow. Its application entails an evolving process. Currently, some new developments have occurred and new issues emerged regarding its application in Hong Kong. Hong Kong needs to improve its systems to uphold national sovereignty, security and development interests. It needs to enhance education and raise public awareness of the history and culture of the Chinese nation. It is yet to build public consensus on some major political and legal issues. The Hong Kong economy also faces quite a few challenges. Hong Kong's traditional strengths start to lose the edge while new drivers of growth are yet to emerge. Housing and other issues that affect the daily life of the people have become more serious. To address these challenges, meet the expectation of Hong Kong people for a better life and advance Hong Kong's development in all sectors, we must stay on the right and steady course, gain a full understanding of the policy of "One Country, Two Systems" and faithfully implement it. Hence, I wish to take the opportunity to talk to you about how to better implement the policy of "One Country, Two Systems" in Hong Kong. 第一，始终准确把握“一国”和“两制”的关系。“一国”是根，根深才能叶茂；“一国”是本，本固才能枝荣。“一国两制”的提出首先是为了实现和维护国家统一。在中英谈判时期，我们旗帜鲜明提出主权问题不容讨论。香港回归后，我们更要坚定维护国家主权、安全、发展利益。在具体实践中，必须牢固树立“一国”意识，坚守“一国”原则，正确处理特别行政区和中央的关系。任何危害国家主权安全、挑战中央权力和香港特别行政区基本法权威、利用香港对内地进行渗透破坏的活动，都是对底线的触碰，都是绝不能允许的。与此同时，在“一国”的基础之上，“两制”的关系应该也完全可以做到和谐相处、相互促进。要把坚持“一国”原则和尊重“两制”差异、维护中央权力和保障香港特别行政区高度自治权、发挥祖国内地坚强后盾作用和提高香港自身竞争力有机结合起来，任何时候都不能偏废。只有这样，“一国两制”这艘航船才能劈波斩浪、行稳致远。 First, it is imperative to have a correct understanding of the relationship between "One Country" and "Two Systems". "One Country" is like the roots of a tree. For a tree to grow tall and luxuriant, its roots must run deep and strong. The concept of "One Country, Two Systems" was advanced, first and foremost, to realize and uphold national unity. That is why in the negotiations with the United Kingdom, we made it categorically clear that sovereignty is not for negotiation. Now that Hong Kong has returned to China, it is all the more important for us to firmly uphold China's sovereignty, security and development interests. In conducting day-to-day affairs, we must be guided by a strong sense of "One country", firmly observe the principle of "One Country", and thus correctly handle the relationship between the HKSAR and the Central Government. Any attempt to endanger China's sovereignty and security, challenge the power of the Central Government and the authority of the Basic Law of the HKSAR or use Hong Kong to carry out infiltration and sabotage activities against the mainland is an act that crosses the red line, and is absolutely impermissible. On the other hand, on the basis of "One Country", the "Two Systems" should and have every reason to stay in harmony and reinforce each other. We must both adhere to the "One Country" principle and respect the differences of the "Two Systems", both uphold the power of the Central Government and ensure a high degree of autonomy in the HKSAR, both give play to the role of the mainland as a staunch supporter of Hong Kong and enhance Hong Kong's own competitiveness. At no time should we focus only on one aspect to the neglect of the other. Only in this way can we ensure that the ship of "One Country, Two Systems" will break the waves, sail steadily and go the distance. 第二，始终依照宪法和基本法办事。回归完成了香港宪制秩序的巨大转变，中华人民共和国宪法和香港特别行政区基本法共同构成香港特别行政区的宪制基础。宪法是国家根本大法，是全国各族人民共同意志的体现，是特别行政区制度的法律渊源。基本法是根据宪法制定的基本法律，规定了在香港特别行政区实行的制度和政策，是“一国两制”方针的法律化、制度化，为“一国两制”在香港特别行政区的实践提供了法律保障。在落实宪法和基本法确定的宪制秩序时，要把中央依法行使权力和特别行政区履行主体责任有机结合起来；要完善与基本法实施相关的制度和机制；要加强香港社会特别是公职人员和青少年的宪法和基本法宣传教育。这些都是“一国两制”实践的必然要求，也是全面推进依法治国和维护香港法治的应有之义。 Second, it is imperative to always act in accordance with the Constitution and the Basic Law. Hong Kong's return completed a major transformation of its constitutional order. The Constitution of the People's Republic of China and the Basic Law of the HKSAR together form the constitutional basis of the HKSAR. The Constitution is the fundamental law of the State. It embodies the common will of people of all ethnic groups in our country, and represents the legal origin of the system of special administrative region. The Basic Law is a basic legislation enacted in accordance with the Constitution. It provides for the system and policies that should be practiced in the HKSAR, codifies into law and makes institutional arrangement for the principle of "One Country, Two Systems", and provides legal safeguards for the practice of "One Country, Two systems" in the HKSAR. In observing the constitutional order prescribed by the Constitution and the Basic Law, it is important both for the Central Government to exercise power in accordance with the law and for the HKSAR to fulfill its own responsibilities as the main actor. We should improve the relevant institutions and mechanisms for implementing the Basic Law and raise public awareness of the Constitution and the Basic Law in Hong Kong, particularly among civil servants and the young people. These steps are integral to practicing "One Country, Two Systems", advancing the rule of law nationwide and upholding the rule of law in Hong Kong. 第三，始终聚焦发展这个第一要务。发展是永恒的主题，是香港的立身之本，也是解决香港各种问题的金钥匙。“一国两制”构想提出的目的，一方面是以和平的方式对香港恢复行使主权，另一方面就是为了促进香港发展，保持香港国际金融、航运、贸易中心地位。当前，发展的任务更应聚焦。少年希望快乐成长，青年希望施展才能，壮年希望事业有成，长者希望安度晚年，这都需要通过发展来实现。香港背靠祖国、面向世界，有着许多有利发展条件和独特竞争优势。特别是这些年国家的持续快速发展为香港发展提供了难得机遇、不竭动力、广阔空间。香港俗语讲，“苏州过后无艇搭”，大家一定要珍惜机遇、抓住机遇，把主要精力集中到搞建设、谋发展上来。 Third, it is imperative to always focus on development as the top priority. Development, an abiding pursuit, is crucial for Hong Kong's survival, and it holds the golden key to resolving various issues in Hong Kong. The concept of "One Country, Two Systems" was advanced to achieve two goals: namely, peacefully resuming the exercise of sovereignty over Hong Kong, and maintaining Hong Kong's status as an international financial, shipping and trading center in order to promote further growth. Currently, more focus should be given to development. Teenagers want to grow up happily. Young people want to bring out the best of their talent. People in mature years want to be successful, and the seniors want to enjoy their golden years. Obviously, all this can only be achieved through development. Hong Kong enjoys the backing of the motherland and is open to the world. It therefore has many favorable conditions for development and distinctive competitive advantages. In particular, China's continuous and rapid development over the years provides an invaluable opportunity, an inexhaustible source of strengths and broad space for Hong Kong's development. As a saying in Hong Kong goes, "After leaving Suzhou, a traveler will find it hard to get a ride on a boat", meaning an opportunity missed is an opportunity lost. It is important to cherish the opportunity, seize it and focus your energy on Hong Kong's development. 第四，始终维护和谐稳定的社会环境。“一国两制”包含了中华文化中的和合理念，体现的一个重要精神就是求大同、存大异。香港是一个多元社会，对一些具体问题存在不同意见甚至重大分歧并不奇怪，但如果陷入“泛政治化”的旋涡，人为制造对立、对抗，那就不仅于事无补，而且会严重阻碍经济社会发展。只有凡事都着眼大局，理性沟通，凝聚共识，才能逐步解决问题。从中央来说，只要爱国爱港，诚心诚意拥护“一国两制”方针和香港特别行政区基本法，不论持什么政见或主张，我们都愿意与之沟通。“和气致祥，乖气致异”。香港虽有不错的家底，但在全球经济格局深度调整、国际竞争日趋激烈的背景下，也面临很大的挑战，经不起折腾，经不起内耗。只有团结起来、和衷共济，才能把香港这个共同家园建设好。 Fourth, it is imperative to always maintain a harmonious and stable social environment. The concept of "One Country, Two Systems" gives expression to the vision of peace and harmony in the Chinese culture. It embodies a very important tenet, namely, seeking broad common ground while setting aside major differences. Hong Kong is a plural society. So it comes as no surprise that there are different views and even major differences on some specific issues. However, making everything political or deliberately creating differences and provoking confrontation will not resolve the problems. On the contrary, it can only severely hinder Hong Kong's economic and social development. Bear in mind the larger interests, communicate in a sensible way and build more consensus: this is the best way to find solutions to issues over time. On the part of the Central Government, we are ready to talk to anyone who loves the country, loves Hong Kong and genuinely supports the principle of "One Country, Two Systems" and the Basic Law of the HKSAR, no matter what political views or position he or she may hold. Harmony brings good fortune, while discord leads to misfortune. Hong Kong is an affluent society, but it also faces enormous challenges posed by profound changes in the global economic environment and the increasingly intense international competition. It cannot afford to be torn apart by reckless moves or internal rift. The people of Hong Kong must be united, work together and help each other, and by so doing, you will ensure the success of Hong Kong, your common home. 当前，我国正处在全面建成小康社会决胜阶段，全国各族人民正在为实现“两个一百年”奋斗目标、实现中华民族伟大复兴的中国梦而团结奋斗。不断推进“一国两制”在香港的成功实践，是中国梦的重要组成部分。群之所为事无不成，众之所举业无不胜。我们既要把实行社会主义制度的内地建设好，也要把实行资本主义制度的香港建设好。我们要有这个信心！ China is now in a decisive phase to finish building a moderately prosperous society in all respects. 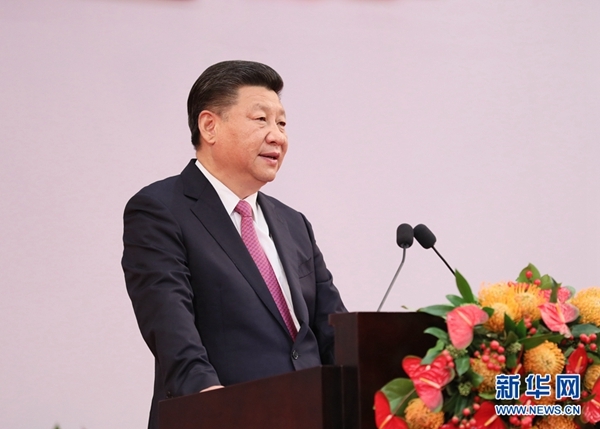 People of all ethnic groups across the country are engaged in a joint endeavor to realize the Two Centenary Goals and fulfill the Chinese Dream of national renewal. Ensuring the continued success of the practice of "One Country, Two Systems" in Hong Kong is part and parcel of the Chinese Dream. A cause with public participation and public support is sure to achieve success. We should ensure the success of development on the mainland which practices the socialist system; we should also ensure the success of development in Hong Kong which practices the capitalist system. We should have every confidence that we will succeed! 今天，新一届特别行政区政府正式成立了，责任重大，使命光荣。未来5年，希望特别行政区政府广泛团结社会各界，全面准确贯彻“一国两制”方针，坚守“一国”之本，善用“两制”之利，扎扎实实做好各项工作。要与时俱进、积极作为，不断提高政府管治水平；要凝神聚力、发挥所长，开辟香港经济发展新天地；要以人为本、纾困解难，着力解决市民关注的经济民生方面的突出问题，切实提高民众获得感和幸福感；要注重教育、加强引导，着力加强对青少年的爱国主义教育，关心、支持、帮助青少年健康成长。 Today, the new SAR government is officially inaugurated. It shoulders major responsibilities and has a lofty mission to perform. It is my hope that in the next five years, the HKSAR government will unite people of all sectors in Hong Kong to fully and faithfully implement the principle of "One Country, Two Systems", stay committed to the basis of "One Country",well leverage the benefits of "Two Systems", and make solid efforts to ensure success of its various endeavors. It is important for you to advance with the times, actively perform your duties, and continue to improve government performance. It is important to focus on priorities, fully leverage Hong Hong's strengths and open up a new horizon for Hong Kong's economic development. It is important to put people first, help them overcome difficulties, especially address prominent economic and livelihood issues that people are concerned with, and truly increase their sense of contentment and happiness. It is important to raise awareness and enhance guidance, especially to step up patriotic education of the young people, to give them more care and support and help them grow up well. 中央政府将一如既往支持行政长官和特别行政区政府依法施政；支持香港发展经济、改善民生；支持香港在推进“一带一路”建设、粤港澳大湾区建设、人民币国际化等重大发展战略中发挥优势和作用。中央有关部门还将积极研究出台便利香港同胞在内地学习、就业、生活的具体措施，为香港同胞到广阔的祖国内地发展提供更多机会，使大家能够在服务国家的同时实现自身更好发展，创造更加美好的生活。 The Central Government will continue to support the Chief Executive and the HKSAR government in exercising law-based governance. We will continue to support Hong Kong in growing its economy and improving people's lives, and in leveraging its strengths and role in advancing the Belt and Road Initiative, the Guangdong-Hong Kong-Macao Greater Bay Area, Renminbi internationalization and other major development strategies. The relevant Central Government departments will actively consider adopting concrete measures to make it more convenient for the people of Hong Kong to study, work and live on the mainland, and provide more opportunities for them to pursue career development on the vast mainland. I am sure that the people of Hong Kong will enjoy brighter development prospects and live better lives while contributing their share to China's overall development. 我坚信，有伟大祖国作为坚强后盾，有中央政府和内地人民的大力支持，有回归20年积累的丰富经验和夯实的发展基础，有香港特别行政区政府和社会各界人士的团结奋斗，“一国两制”在香港的实践一定能够再谱新篇章，香港一定能够再创新辉煌！ Hong Kong has the strong backing of the great motherland and the strong support of the Central Government and the people of the mainland. Hong Kong has gained a wealth of experience over the past 20 years since its return; it has a solid foundation for achieving further development, and it enjoys the concerted dedication of the HKSAR government and people in all the sectors. With all this in mind, I am convinced that the practice of "One Country, Two Systems" in Hong Kong will write a new chapter and create new splendor for Hong Kong!